The Martingale is the strap of a horse’s harness that connects the girth to the noseband and is designed to prevent the horse from throwing back its head. Martingales are used by many riders, particularly when jumping and when riding young or strong horses. The Martingale helps to give that extra control by preventing the horse from raising its head beyond the point of control. The most popular is the Running Martingale which separates into two straps with a ring at the end of each. The reins pass through the rings and evens the stability of the reins and bit and makes downward pressure on the mouth if the horse raises his head too high. 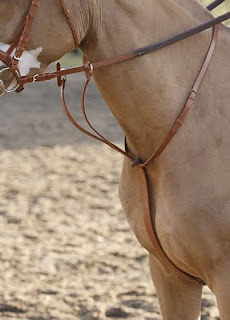 The Martingale has no effect on the horse if it is performing correctly and provides a neck strap for awkward moments. It also allows the rider to open the reins a little. The Running Martingale is very commonly used in show jumping and cross country and is very popular with riders in general. A problem can arise when some horses try to grab the straps of a Running Martingale in their mouths. In these instances an alternative Martingale might be used, such as a Bib Martingale. The Bib Martingale will be covered in a future article together with details about Sliding Martingales.